The REESE Towpower<sup></sup> under 80 inch LED rear trailer light kit is easy to install, includes all hardware and complies with legal lighting & reflectors for the trailer. 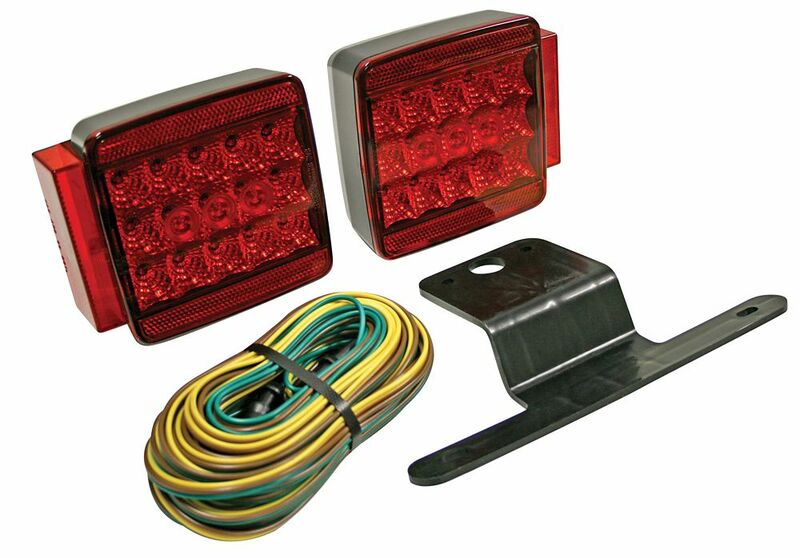 Complete with everything you need to install rear lighting on your trailer, this kit even has the license plate mounting bracket. The long life LEDs and the stainless steel bolts will give you extended service over the traditional incandescent lighting kit. Upgrade your trailer with brighter and longer lasting lights. Rest assured REESE Towpower<sup></sup> lighting products comply with Department of Transportation light requirements. This REESE Towpower<sup></sup> towing adapter is designed to convert a 7-way blade connector to a 6-pin round, or a standard 4-way flat connector. It features a switchable 6-pin round to meet the trailer needs. It also includes the LED circuit tester which constantly checks for completed circuit confirmation. Not only can you adapt the trailer to vehicle fast, but you can be certain the connections are correct. LED Submersible Trailer Light Kit The REESE Towpower<sup></sup> under 80 inch LED rear trailer light kit is easy to install, includes all hardware and complies with legal lighting & reflectors for the trailer. Complete with everything you need to install rear lighting on your trailer, this kit even has the license plate mounting bracket. The long life LEDs and the stainless steel bolts will give you extended service over the traditional incandescent lighting kit. Upgrade your trailer with brighter and longer lasting lights. Rest assured REESE Towpower<sup></sup> lighting products comply with Department of Transportation light requirements.